Here are a few ideas for games you can organise at parties at home with kids. Organising a main game will help keep the children occupied for a large part of the afternoon and has advantages for everyone. Not just for the kids who’ll go home full of happy memories but also for you. As parents you’re probably not professional party organisers, but with a well-planned activity on the programme, the time will pass remarkably quickly and happily occupied kids equals a happy time for all. 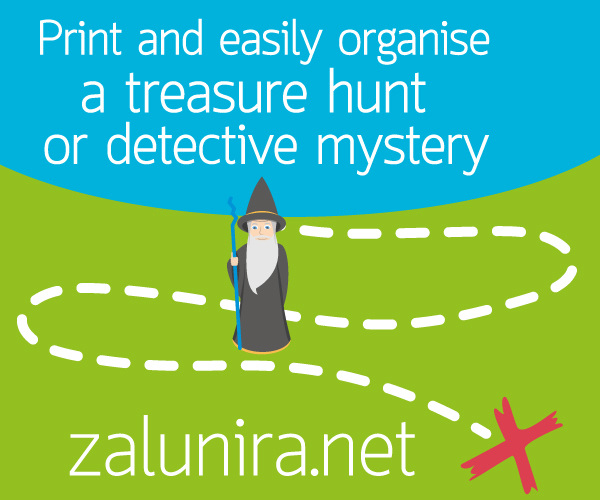 A treasure hunt is one of the most popular kid’s party games. The base for organizing any treasure hunt is an original story, a story where the children have to find a hidden treasure, help someone in difficulty or solve a mystery. Kids set off in search of the riddles that have been hidden by the organizer, each riddle when solved will provide them with a clue leading them on to find the next riddle, and so on. Finding and solving all the riddles leads to the hidden treasure or the solution to the mystery. Similar to the ever-popular treasure hunts, the kids move from clue to clue in our whodunit detective mysteries. However the aim of the game is different, as each puzzle is solved and each clue uncovered, kids work towards solving the crime and discovering the culprit. Originating in Mexico, the Piñata is a very popular game at children’s parties. A Piñata is a suspended container, which can take any shape (figurine, animal, etc. ), filled with little gifts such as sweets or small toys. Kids try to break the Piñata using a stick while blindfolded. The Piñata should be attached high up with string, to a branch or beam for example. To avoid any accidents the children wait their turn to try to break the Piñata. Standing under the Piñata each child hits it with a stick to try to break it. Once broken, the children can all retrieve the contents. In an Olympiad (or Olympic Games), kids are divided into several teams of equal ability; each team being given a name relating to the theme of the party. The teams then compete against one another in a series of small events: a football match, tug-of-war, balancing competition, sack race, etc. Choose from any our party games below. Each team who wins an event is awarded points (3 points for the winning team, 2 points for a draw, 1 point for a defeat), just as in a real sports competition. When all the events are over, you add up the points and the team with the most point wins the Olympiad. You could even organise an award ceremony and offer sweets or small toys to all the participants. Based on recreation centre or school activities, there are dozens of games which are ideal for kid’s parties: Aunt Sally, King/Queen of Silence, Dodgeball, Grandmother’s Footsteps or a football match for example. Easy to organise, these party games can last as long as you like.